Q1: What do I do the first time I log onto InsynQ? Log into your InsynQ Virtual Desktop: refer to the InsynQ support page here for more information or further help with setting up your InsynQ account. Open QuickBooks to the correct QuickBooks file. When prompted "Do you want to install this application", for the Method Integration Engine, click on Install. Check for the Method Integration Engine icon in your Windows system tray at the bottom right corner of the screen. If it is not visible, click the arrow icon in your taskbar next to the clock in the lower right-hand corner of your screen to display all icons, then locate and double-click on the Method icon to bring up the Method Sync Engine. Enter your Method Company Account, Username and Password, then click Connect. If you don’t remember your Method Company Account and Username, refer to the registration email you received. 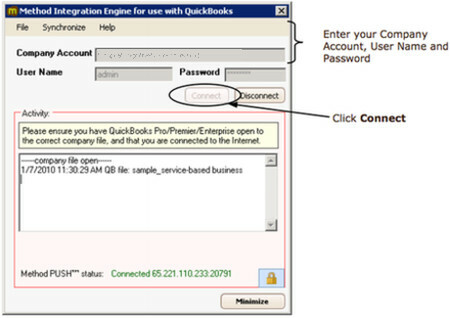 You will only need to enter this information the first time you log on to your QuickBooks file. The Method Sync Engine is smart enough to remember the information so the next time you log on, it will automatically connect and perform a full sync. When prompted by QuickBooks, click the ‘Yes; always…’ option, then click Continue. QuickBooks will prompt you twice, use the same selection for each prompt. Method then performs a full synchronization. After this is completed, verify your data has been transferred; you can do this by checking to see if all your customers are listed in Method by going to Customer Center > Customer List. 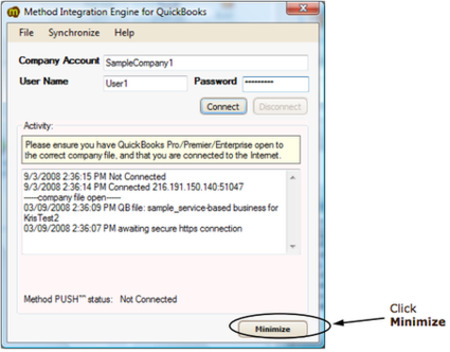 Keep the Method Integration Engine running on your computer at all times while QuickBooks is opened. To verify that the engine is running, you will see a small Method notification icon at the bottom of your screen. If your InsynQ session is inactive for approximately 3 hours you will be disconnected from InsynQ, and subsequently the Method Integration Engine will also disconnect. Q2: Every time QuickBooks launches, I receive a request to install Method Integration. Is that normal? Yes, that is normal for all shared InsynQ Desktop Accounts. Double click the Method Icon from your Desktop or start menu, then always click on Install for the first pop-up. 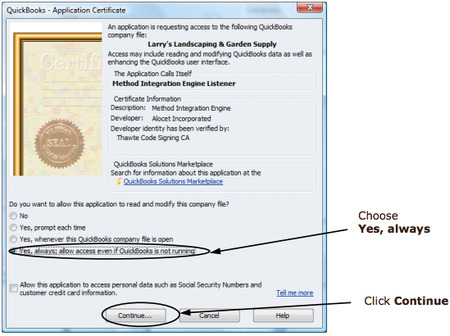 This takes about 10 seconds, and you will be prompted every time you open QuickBooks. InsynQ does offer another private cloud service, but if you have this type of account, the installation message will only come up during the setup. Q3: Who do I contact if my internet does not work? Contact your Internet Service Provider (ISP). If your internet is working but you are unable to get on to InsynQ then contact InSynQ. Q4: Who do I contact if transactions are not syncing between Method and QuickBooks? Contact the Support team at Method Integration. Q5: Can I leave my QB open 24/7, even when I’m not on InsynQ? No, your terminal server session will be disconnected if left inactive for approximately 3 hours. You need to contact InsynQ to set up a InsynQ account. If you intend to use Method Integration on InsynQ let them know. Q7: How do I log on to InsynQ and what are the system requirements? Q8: What happens if I decide to leave InsynQ for another hosted solution or having it local on my computer? Are there any special steps that need to be followed? If you switch to a different QuickBooks file, you will need to get a new Method account. If you will be using the same QuickBooks file, you will have to perform a full sync once QuickBooks is set up on the new location. Q9: I have setup my QuickBooks on InsynQ, but I still want to be able to log on to my QuickBooks File stored locally on my computer in the office/ home. What happens in this situation? This is not permitted because it would result in you writing to two different QuickBooks files stored in different locations.